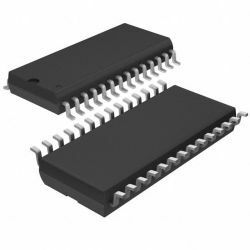 The DGD2136 is a three-phase gate driver IC designed for high-voltage / high-speed applications, driving N-Channel MOSFETs and IGBTs in a half-bridge configuration. High-voltage processing techniques enable the DGD2136’s high-side to switch to 600V in a bootstrap operation. The DGD2136 logic inputs are compatible with standard TTL and CMOS levels (down to 3.3V) for easy interfacing with controlling devices and are enabled low to better function in high noise environments. The driver outputs feature high-pulse current buffers designed for minimum driver cross conduction. The DGD2136 offers numerous protection functions. A shoot-through protection logic prevents both outputs from being high when both inputs are high (fault state), an undervoltage lockout for VCC shuts down the respective high side output. An overcurrent protection will terminate the six outputs. Both the VCC UVLO and the overcurrent protection trip an automatic fault clear with a timing that is adjustable with an external capacitor. The DGD2136 is offered in SO-28 (Type TH) package and the operating temperature extends from -40°C to +125°C.